Schneids: Tell us a little bit about your poker playing history – how long, how often do you play, what got you into poker, or anything else related to your development as a player? Michelle: I have been playing for about ten years. I started just watching my husband play and thought I could do it. It took about two years to cash in a tourney… Now I play at least twice a week. My hubby and I have been in a league for the last 4 years. I was privileged to be able to play the main event in the WSOP last year because of the league. Schneids: Real cool, that must be some league if it’s large enough to help players get into the WSOP main event, so awesome! The really is no tournament on earth like it, what a poker player’s dream! I also saw you cashed at the last MSPT at Canterbury, congratulations! I understand $1k buy in tourneys are pretty new for you, correct? Will we be seeing more of Michelle Day in them? Michelle: That is correct. I got in to that tournament on a $65 satellite. I hope to play more tournaments like that in the future. It was a blast! Thanks! Schneids: $65 into an MSPT cash is an awesome ROI, well done! You and your husband put on a pretty cool charity tournament, as well, that benefits Protecting Paws. Please feel free to use this stage to tell us about how that came to be and what it is? Michelle: We have been putting on the charity poker tournament for about four years. I was the adoption coordinator for a few years and we wanted to help out the rescue. We have raised over $12k for Protecting Paws and have saved hundreds of dogs and cats. We have personally fostered over 15 dogs and only failed on one! Our whole family is very involved in rescue. Schneids: Please make sure I’m aware of when it is next year, I want to play it. I’ve done some volunteering for the MN Humane Society too, and love fur balls — especially cats. In addition to your love for animals, when you’re away from the table, what activities and interests take up you and your family’s time? Michelle: We spend a lot of time with our family (Lindsay,28, Colton, 26, Cassie, 21), boating, playing games, and reading. Schneids: You finished second place in one of our two “Winners Shown” events last fall. Do you have any tips for people who have yet to play it but might give it a try for their first time on Saturday? As an observer it was hard for me to tell if it was changing the way people played, or just to what extent it might make you second guess whether to try to run a bluff, etc? Michelle: Just try it and have fun! Schneids: So simple and true — fun is the reason almost all of us first got into poker. I like it. One last Q I love asking everyone: you can fill a poker table with anyone, living or dead. Who is playing poker with you and what game(s) are being played? 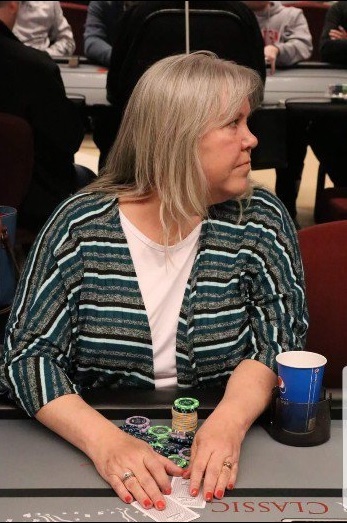 Michelle: That is easy…I would fill it with local poker players that I have enjoyed learning from and some playing against. Players such as Tom and Sherry Hammers, Mark Hodge, (all were helpful in Vegas last year). Matt Hamilton, John Alexander, and lots of others from our league who have helped shape me into the player I am. Schneids: That’s an awesome group of players who are both real good at the game, and awesome people. Thanks again for taking the time to chat with me, and hopefully see you at the tables in some of our next PIFT events and other area tournaments!